When you have people coming to stay at your home as overnight guests, it’s important to make sure they’re as comfortable as possible. In order to do that, it’s great to set aside one room that’s specifically for guests. The next time you have to prepare a guest room, take these tips into consideration. It’s wise to make sure that you have good lighting in the room. Place a light at each workstation. If you have a vanity, make sure there’s a light available so that if a guest is applying makeup or doing their hair, they can see what they’re doing. Make sure there’s lighting by the bedside, such as a lamp on a bedside table, so that if your guests want to read a book before they fall asleep, they’re able to do so. Make sure that you purchase comfortable linens. This is one of the areas you’ll want to invest money in because you don’t want your guests to be uncomfortable and tired because they didn’t sleep well. Comfort is important. Invest in comfortable sheets, towels, and comforters. Always provide all options so that if your guests decide that they’re too hot or too cold, they can adjust accordingly. Keep the guest room as neutral as possible. This is not the place for neon pink and bright yellow. If anything, try muted tones of gray, cream, and soft blue. Colors can make a difference in helping a person relax. If your guest is thirsty in the middle of the night, it’s really inconvenient to walk all the way to the kitchen to get some water. Leave bottled water in the guest room. You can even leave a mini-fridge in the room. You can stock it with a few beverages and fruit. You can even provide a small electric kettle for instant coffee or tea. This is a great way to provide sustenance for your guests without having to go out of your way to make it happen. Choose dual-purpose furniture so that you can cater to a variety of needs. Dual-purpose furniture is very functional for guests. It doesn’t have to be obvious what the dual purpose of a piece of furniture is. For example, the best sleeper sofas are so stylish that you would never be able to tell that the sofa serves a dual purpose just by looking. Another piece of furniture that could serve a dual purpose is a vanity; it could serve as a place to get ready in the morning, but also as a work desk for somebody who wants to finish a few assignments during their downtime. Just like there are many people who cannot sleep without a bit of white noise, there are many more people who love falling asleep with a fan. Provide a simple standing fan that your guests can choose to plug in and use if they want to. The same concept applies to a space heater. Make sure the space heater is one that is safe enough for guests to use when it’s time to sleep. Some space heaters can be a safety hazard if they’re unattended. The last thing you want is for your guests to leave and complain about an offensive smell. Always provide a light scent to fill the room. Choose scents that are light because you don’t want anything that overpowers the room. Some scents are almost universally liked, and many scents have been shown to improve happiness. Scents like pine, vanilla, citrus, or peppermint tend to please most people. You can use plug-ins, air fresheners, or candles to set the mood. Diffusers are really lovely to use as well. They gently release essential oils into the air. Area rugs are so helpful because they have a way of adding coziness to a room. When you’re picking out an area rug, it’s important to make sure you find the right size. Too often, people choose area rugs that are too small for the room it’s going in. Take measurements of the room and when it’s time to pick out a rug, don’t be afraid to pull out your measuring tape to compare numbers. Even if you have carpet on your floors already, you can still add area rugs to the space. Area rugs have a way of bringing a room together. You can choose area rugs that have fun patterns, prints, or subtle designs. You can’t go wrong with a great-looking rug. Another way to be a great host is to stock the guest bath with items that they can use, like a towel, shampoo, conditioner, and shower gel. If you really want to go above and beyond, you can add things that are commonly forgotten, like a new toothbrush and travel-sized toothpaste. Or you could add some luxury items like bath bombs or a towel heater. As you continue to create the perfect guest room, understand that it will take some time. Think about the amenities you would want in a guest room. 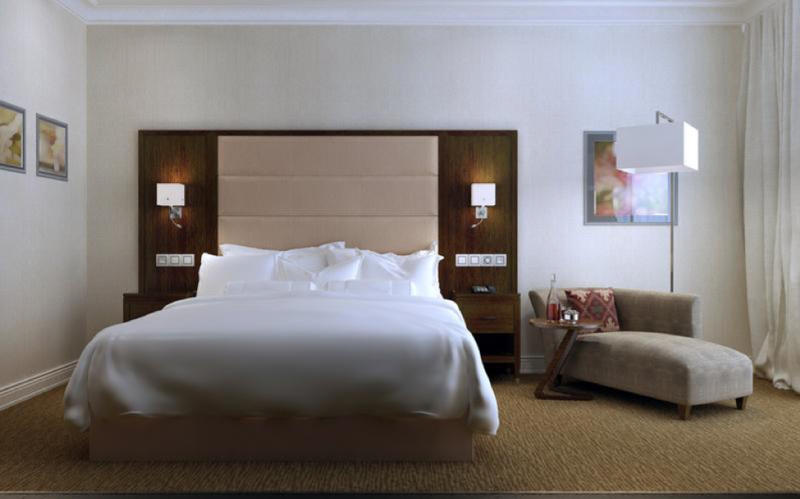 Take a look at hotel rooms and different amenities you appreciate in a room. When you take those same details and apply them to your guest room, this will help you create the most ideal environment for your guests.